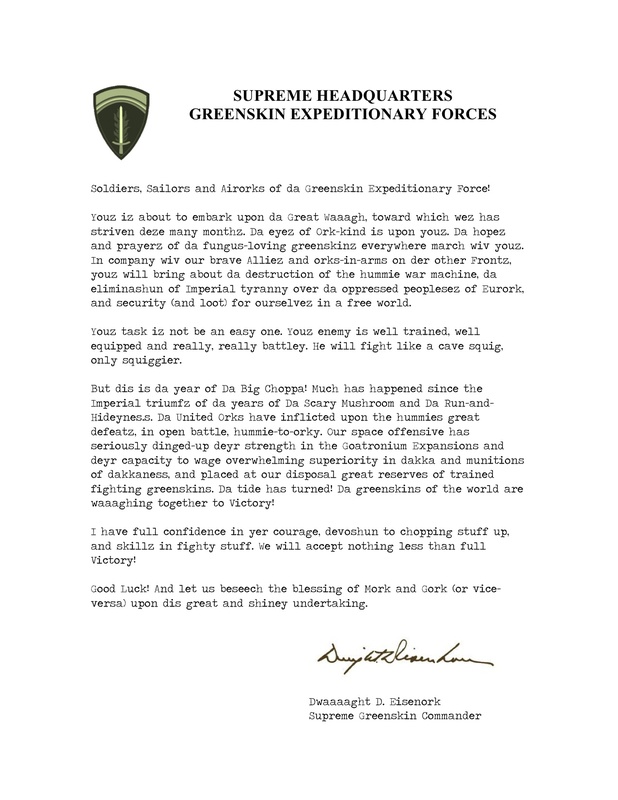 After weeks of planning, the Supreme Headquarters of the Greenskin Expeditionary Force has given the go-ahead for Operation Overwaaagh, commencing with the allied amphibious landings at Orkandy. Warboss Vince was assigned the landing at Swaaarghrd Beach, with forces from the 3th Orkantry Division and the 6th Orkborne. The area is defended by the 716th Imperial Guard, a relatively low- quality unit. These forces are well fortified, however, including three large bunkers above the beach, plus trenches, minefields, obstacles, and barbed wire. In addition, there is a battery of fortified heavy guns at Squigville (protected from bombardment by a powerful void shield) that would be able to target the main landing beaches. Imperial reinforcements are expected from the 716th Imperial Guard (generally arriving to the north and northeast) and the formidable 21st Space Marines (generally arriving to the north and northwest). The latter in particular could pose a serious threat to Allied forces. Greenskin forces should have complete air superiority. Secure the two landing beaches (Sectors Mork and Gork), and breach the seawall so that vehicles can exit. Neutralize the gun battery at Squigville, if possible. Secure the towns of Fungus-sur-Mer, Orkeham, and Grotville. Block any counterattack from the 21st Space Marines. Having established a beach-head, push inland from the Orkandy beaches and exit forces to the north.